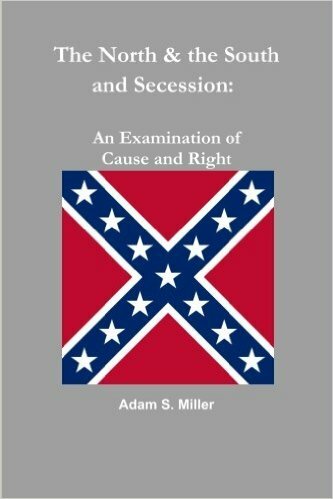 Book review of The North & The South and Secession: An Examination of Cause and Right, Book I, by Adam S. Miller, Monrovia, MD: Tower of David/Marian Pub., Inc. 2006, 114 pp. In this first book of a series of four, Adam Miller takes it upon himself to begin the refutation of the many myths that have been spread around the bloodiest conflict in our History, the American Civil War (1861-1865). Taking a Catholic perspective, the author examines the cultural, economic and political events before and during the war and focuses in on the vital topic of legitimate authority regarding states rights and powers of secession. The author presents his information in a concise and engaging manner. Primarily written as a polemic, the book constructs a framework of the American North and South before delving into the issues of secession and the conflict proper. In this work Miller makes a strong argument that the Southern States had acted correctly and were well within their legal rights to withdraw from what had become an exploitative and tyrannical Union. With this series, the South, so vilified in the revolutionary media and historical propaganda textbooks, is shown for what it really was: a traditional, honorable and religious society standing against the unjust authority of a central government run amok. The author begins by painting a picture of a Southern society and way of life very different from now. It was a more genteel life of the countryside, with only 1/10th of the population living in cities. The agrarian pace of life was complemented by a strong Catholic influence left by the Spanish and French colonies as well as Catholic immigrants. Historically, there were over 80 Catholic settlements in the South before 1682. Though predominantly Protestant, the South was more strongly influenced by Catholic Europe in its hierarchy, moral orientation and family centered life. The South had a society greatly influenced by the organic life and charm of an Europe previous to the Enlightenment. It counted many Catholic politicians and men of influence among its members. The North contrasted with the South in almost everything. In the North Protestantism and Rationalism had taken deep root. Economic output was the gauge for success and utilitarianism was the order of the day. Beauty and hierarchy were scorned in favor of barren pragmatic utility. Homes were considered more as places for individuals to rest before returning to factories than the center of a family life. Before the war, as the nation developed, the North and the South drifted further apart. The North slowly gained a majority of members in the House of Representatives and the Senate and it was not long before laws were being passed that deliberately favored the North and harmed the South. It would have been natural for the South to send its cotton to northern factories to be made into cloth goods. With cotton plantations in the South and many nearby Northern factories this would seem a matter of good business sense. However, Northerners industrialists were so greedy that the exorbitant prices they charged for such work made it cheaper for the South to export its cotton all the way across the seas to European factories, and this is what many Southerners did. To ‘remedy’ this loss of business the Northern-dominated Congress continuously passed tariff laws to charge taxes on such trade. Thus, the Southerner was being penalized for using good business sense, while the North was rewarded regardless. In 1860, the South alone would have been the third largest economy in the Western world, shattering the myth of the South being destitute and backwards. However, because of steep tariffs approved by the pro-Northern Congress, by the 1850’s there were approximately $90 million in dues paid by the South, compared to only $17 million paid by the North. Since 1833, nearly all of this surplus tax revenue had been regularly applied toward developing the North. With these federally enacted measures it was clear that the federal government was increasingly serving the interests of the Northern industrialists to the detriment of the South. Miller takes special care to study the legal rights and implications regarding the authority of the States and the powers of secession. As a Catholic, he points out that authority ultimately comes from God and not the consent of the people, as the revolutionaries like to pretend. This principle could be found in any form of government before the Enlightenment, mainly in Catholics monarchies. Even the pagan authority of ancient Rome merited obedience from its Catholic subjects, so long as it did not demand sinful acts. It was the reigning authority of King George III that granted sovereignty to the American States in the 1783 treaty of Paris. Following this, and the abortive Articles of Confederation, the States met to ratify a new Constitution that would delegate authority to a weak central government, thus forming our first federation. According to natural law, federal governments such as these have the power to look after the common good, such as in matters of common defense, but the authority delegated to the federal government does not surpass that of the sovereign States that compose the Federation. The States – either from the South, like Virginia or from the North, like Vermont – possessed an authority that was the basis of that of the central government, and the Founding Fathers sought to safeguard this sovereignty with Article II of the Constitution and the Bill of Rights. This established that all powers not explicitly granted to the federal government by the Constitution were retained by the States. At the Philadelphia Convention that framed our Constitution, the Founding Fathers unanimously rejected giving the government powers to invade non complying States. 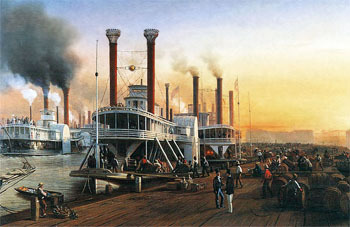 With these points Miller gives us a picture of the United States of the early to mid 19th century. We have, on the one hand, the tradition oriented and agrarian South and, on the other, the pragmatic and utilitarian North. 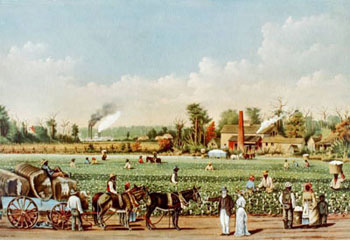 Controlling two of the three branches of the federal government, the North began a systematic exploitation of Southern wealth, passing laws that favored Northern industry and hurt the agricultural South. As the two regions continued to drift apart, few believed it was possible for such radically different regions to co-exist under one government. Many noted that the North and the South were two cultures completely alien to each other, with only language as the common bond between them. As the economic and political power of the North grew, it seemed that the very way of life of the South was in danger. The laws and tariffs of the land were designed by Northern politicians to drain Southern business. Northern congressman took public money – much of it squeezed out of Southern business and farms – and distributed it exclusively to the North. As the few Southern politicians exhausted every conceivable means to protect their economy, culture and heritage, it seemed that there was hardly any recourse left for the South. With the election of Abraham Lincoln in 1860, a president elected with less than 40% of the popular vote and no support from a single Southern State, every branch of the federal government was now occupied by powers acting in Northern interests. Though conventional history texts like to depict Lincoln as a president who worked to alleviate North-South tensions, it must be remembered that the Republican Party, Lincoln’s party, had actually been founded on an explicitly pro-North bias, favoring big business, industry and high tariffs. Proving his party loyalty, Lincoln quickly raised tariffs from 18.8% to a painful 47.5% following his election. Thus, in 1860-1861 many Southerners concluded that they could no longer hope for any redress from the federal government. It seemed to the South that the only way to protect its interests, security and liberty was to withdraw entirely. The Southern States began to secede.